I cook with shallots. Not often because they just seem so expensive. I have put them in soups and even in a “salsa”. Recently I met my friends out at a restaurant. I had already eaten dinner but they had ordered a salad and I asked to try the shallot. 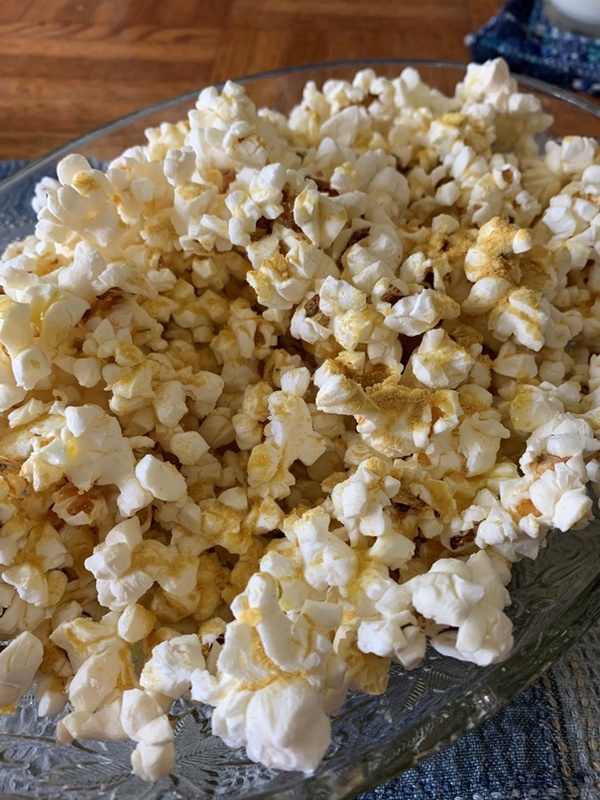 I had thought I hadn’t had a raw one before, but here I am looking at my blog and I see my Persimmon Salsa post where I used shallots. I had tried them raw but just forgot. 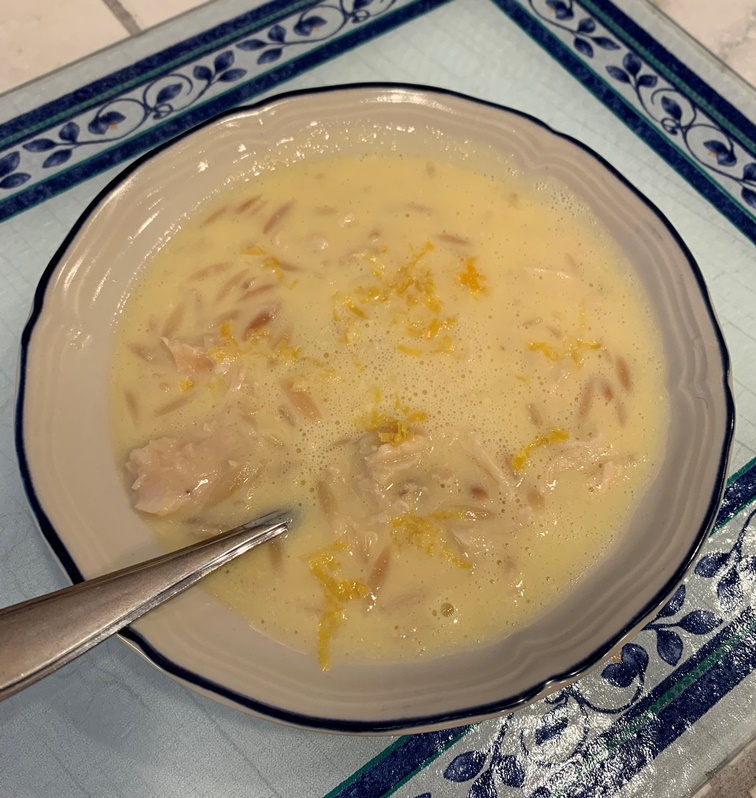 Well, last Friday I was at a loss as to what to cook for dinner and I saw that we had macaroni and cheese. Yes, the boxed kind from Kraft. Sometimes that is about all my brain can handle to make for dinner. I decided that was what we were having for dinner. We had just received an organic produce box that morning and it had shallots in it. Doesn’t that make perfect sense? Organic produce and boxed mac-n-cheese? No, of course not, but sometimes that is what happens. 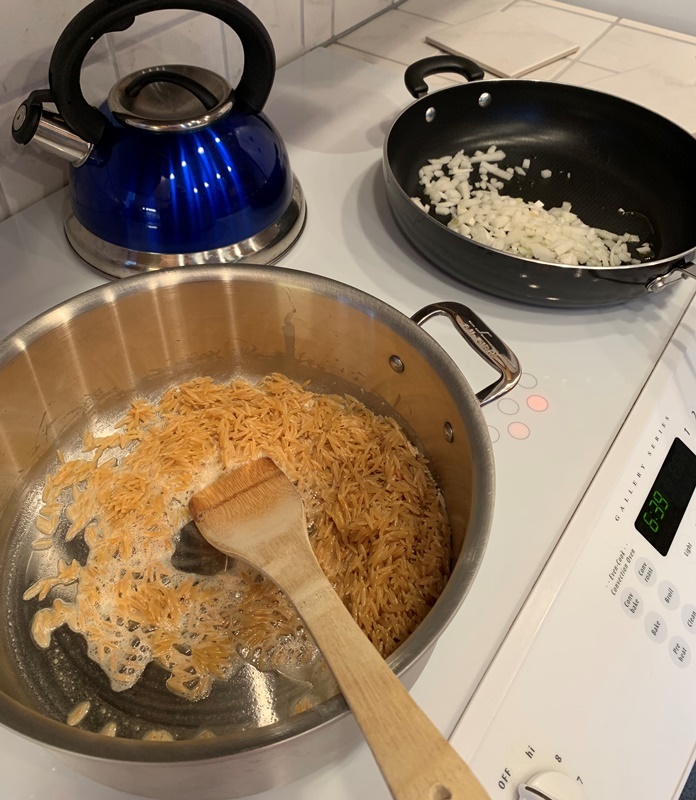 I decided to put some shallots in the mac-n-cheese. Since the macaroni and cheese was going to be dinner I felt it needed to be more than just mac-n-cheese. I pretty much ALWAYS add a bell pepper. We rarely just eat plain mac-n-cheese. But we needed more. So I put some chicken in it. 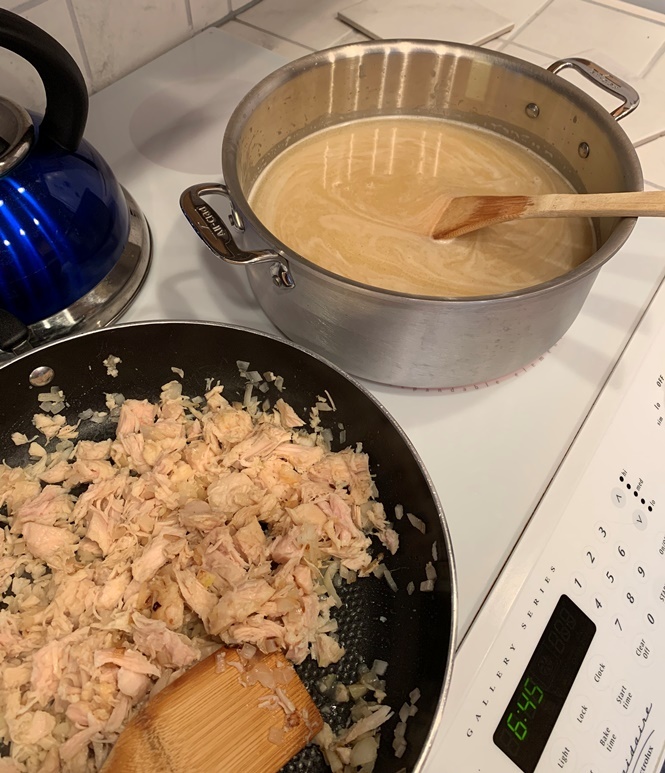 I sauteed some chopped shallot and then added the chicken. I sauteed the bell pepper, too. It all was added to the mac-n-cheese. Well, the shallots just elevated the heck out of that macaroni and cheese. It was really good. There isn’t much nutrient-wise to a shallot, but they really have a great flavor. I love onions and garlic, but shallots are so much better. I knew that, but, as I said, I don’t buy them often because of their expense. But I might start buying them more often because they are so delicious. Wiki says: “The shallot is a type of onion, specifically a botanical variety of the species Allium cepa. The shallot was formerly classified as a separate species, A. ascalonicum, a name now considered a synonym of the currently accepted name. I love them. How about you? Do you like shallots? Do you cook with shallots? Nutrition Facts per 2018 Nutritionix, I couldn’t find it on the USDA website. 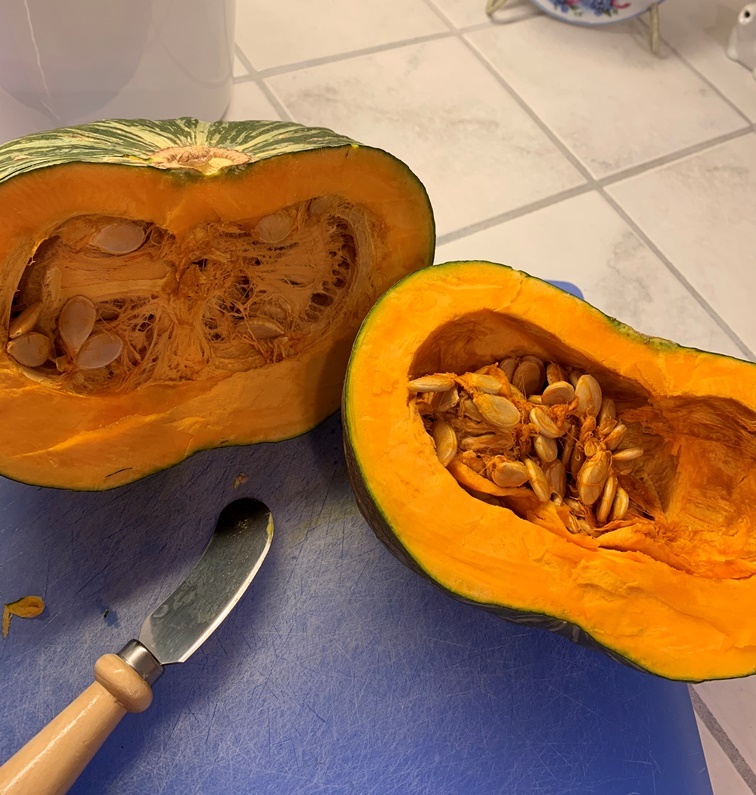 I think it is good and can be used in the place of a sugar pie pumpkin when making soup or just roasting it to eat. I think it would make a good replacement for a pie because people say it is sweeter than a pumpkin, but I don’t know because I do not make/bake pumpkin pies nor do I eat them so I don’t know if it would be a good substitute. 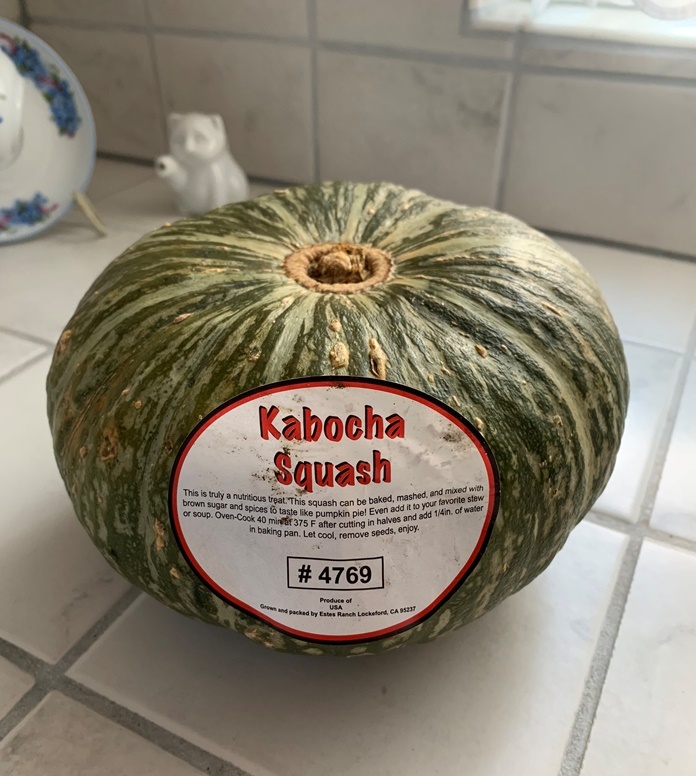 I just had a butternut squash tonight and I don’t know that I would agree with the information I am seeing on the internet about kabocha squash being sweeter. I would have to taste them both side by side to decide. If you were to ask me right now I would say the butternut squash is sweeter. But I did not eat a lot of Japanese pumpkin when I had it. I just barely took a taste because I wanted to see if it would work in the soup. I didn’t cook it exactly like I do/did butternut squash. But still it was not that different. I would say I do not agree with the internet information. It could be the skin. Perhaps the skin on the kabocha squash makes it less sweet. I don’t know, but butternut squash is so sweet. Do you like butternut squash? Do you thing you might try a Japanese Squash? Last week I decided to make pumpkin soup for Thanksgiving. Ever since our dads died we don’t really do Thanksgiving. My husband’s siblings are off with their kids and I don’t have any siblings. So we do our breakfast in Capitola – although we might have to actually eat breakfast somewhere else before going to Capitola as this year nothing was really open for full breakfast – and then we just eat whatever for dinner. Last year I didn’t even think to plan anything for dinner and I think we ended up going to Chavez market to get burritos. This year I decided to make pumpkin soup. The problem with that is pumpkins are gone from the stores by Thanksgiving. I sort of expected that, but I was HOPING there would be some, but there was not. I am very thankful for cellular service and Google – while standing in the store I decided to try something else. 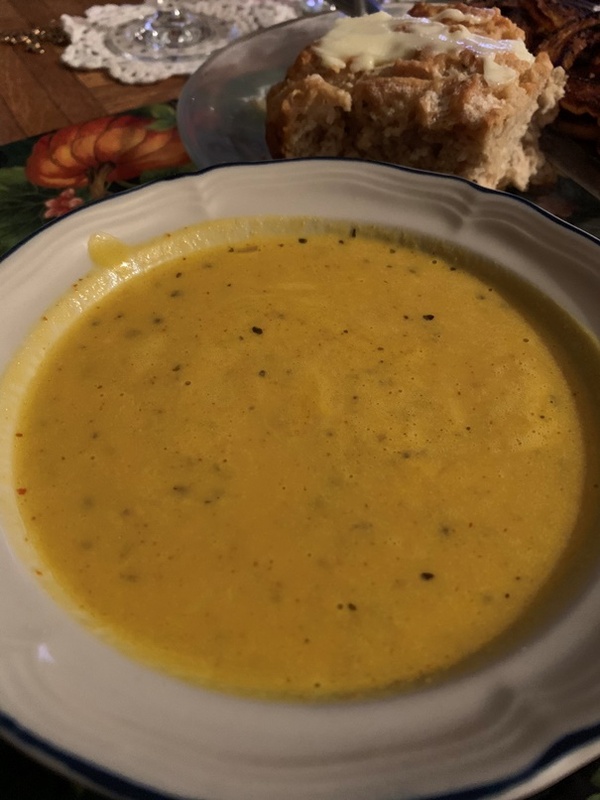 I was thinking any type of winter squash would work, it would just be squash soup. There was this not-so-attractive-green-pumpkiny looking thing and I looked it up and it is actually called a Japanese pumpkin. So cool. I decided to try the Kabocha squash. As I said the Kabocha squash is also called a Japanese pumpkin. Wiki also said that it is even sweeter than butternut squash. 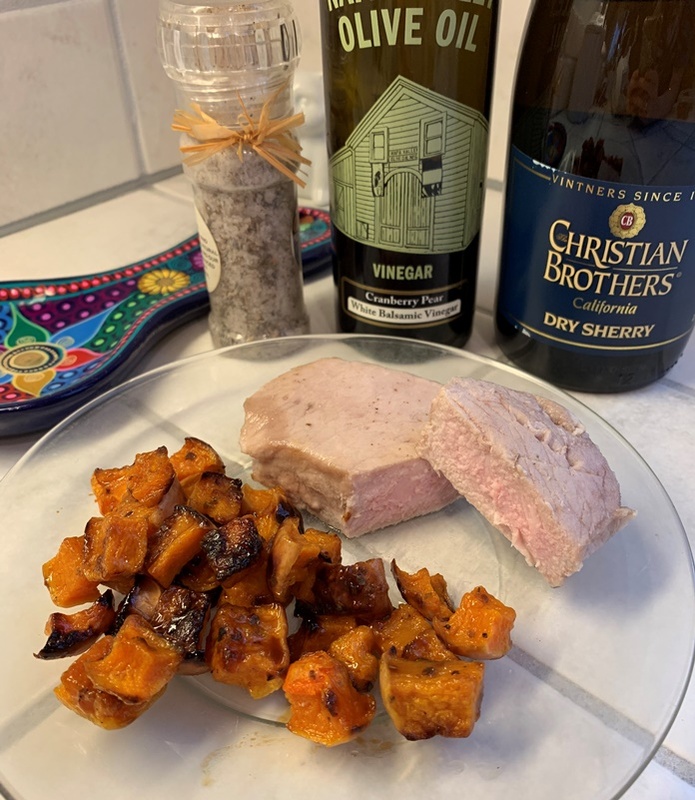 I thought this was great as it would help cut down on the bitterness (although the Roasted Pumpkin Soup 2.0 recipe took care of that). The store also didn’t have any heavy cream so I got half and half. I thought that would be good too, since the kabocha squash is said to be sweeter. The half and half would be less sweet than the heavy cream so I was confident it would all work out fine. Well . . . let me tell you, that Kabocha squash is SUPER difficult to cut. The skin is very thin, but it is super tough. It was a challenge. Not impossible, but way more time consuming than I had planned. I had planned to hop in the kitchen cut up the Japanese pumpkin and throw it in the oven then have time to do other things, but no, it was tough. I roasted it with Milanese Gremolata olive oil, salt, and marjoram and it came out lovely. It is a very good squash. Using it for the pumpkin soup was fantastic. It worked out great. I used the skin and all in the soup. I just roast it and then put the chunks in the blender. Now I know that I can get two sugar pie pumpkins and a Japanese pumpkin over the Fall Season. So that means one or two stuffed pumpkin dinners and/or making pumpkin soup one or two times. We ate pumpkin soup for four days and we were actually sad last night to finish it. It was very good. Oh . . . . I did add a cup or two of broth each night when I heated it up. It got VERY, VERY thick. So I mixed in a cup or two (depending on how much I was heating up) to help thin it out. Now you know you can make pumpkin soup with a sugar pie pumpkin or a Japanese pumpkin. Or perhaps you already knew that. 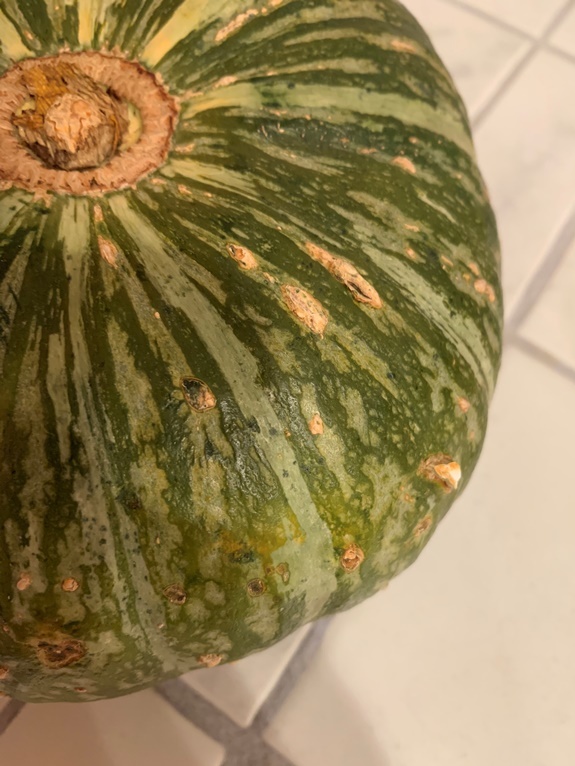 Did you know about the Kabocha squash? We recently went on a trip to Napa. Napa is famous for producing wine. It is amazing because it is one of the smallest wine producing areas in the world. We like to go every once in a while and do some wine tasting. It had been about three years since we last were there. The plan was to visit wineries a couple of days and downtown a couple of days. We had a driver so that we could both do the wine tasting at various wineries. We had a good time. When we go, we like to stay close to downtown so that we can walk to it and visit all the shops and also do some wine tasting at the wine shops and tasting rooms. But, I don’t know that we will do that the next time we go because it seems like the quaint little shops are gone and it basically is a bunch of expensive boutiques now. We didn’t even go into any of the stores, except for the one that is a part of the Square One Tasting Bar. There is a counter in the store and you can sip and shop at the same time. In addition to wine and stuff Napa Valley Olive Oil is in there. They have flavored olive oil and flavored vinegar. Ooooooo! So yummy. 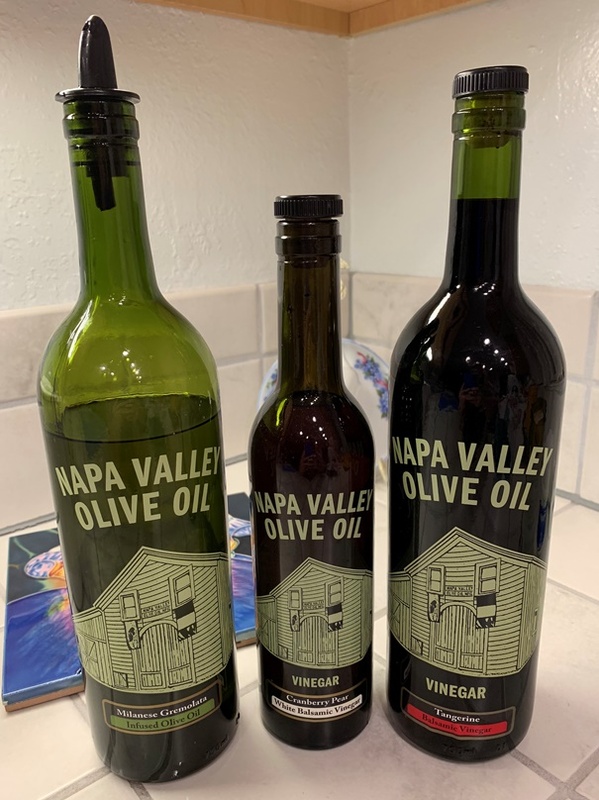 We took our time drinking our tastings and so I was popping over to the olive oil/vinegar side and grabbing some bread and oil and vinegar. There were so many, I can’t even tell you. I tasted probably about seven or eight and I didn’t even scratch the surface it seemed. I did find a new oil that I am in love with. It is Milanese Gremolata Olive Oil. It is so good. I had Milanese Gremolata before at Italian Restaurants. They bring a dish with olive oil and Italian flat leaf parsley, minced garlic, fresh lemon zest in it. When I dip the bread in I try to get some of the Milanese Gremolata on the bread. But this olive oil is infused with the flavors. There is nothing floating in it, but it is so flavorful I just can’t get over it. I have been using it on everything. I put it on our pasta and used it in my pumpkin soup. I think I am going to have to get a subscription for it. It is so good. I also got two vinegars from them. It was difficult to decide, but I kept it down to just two. One was one that the wine shop person recommended I try. She was right, it is so yummy. I got Tangerine and Cranberry Pear. These three things are going to be working their way into all of my cooking. Do you like flavored oil? Do you like flavored vinegar? Do you have a favorite? 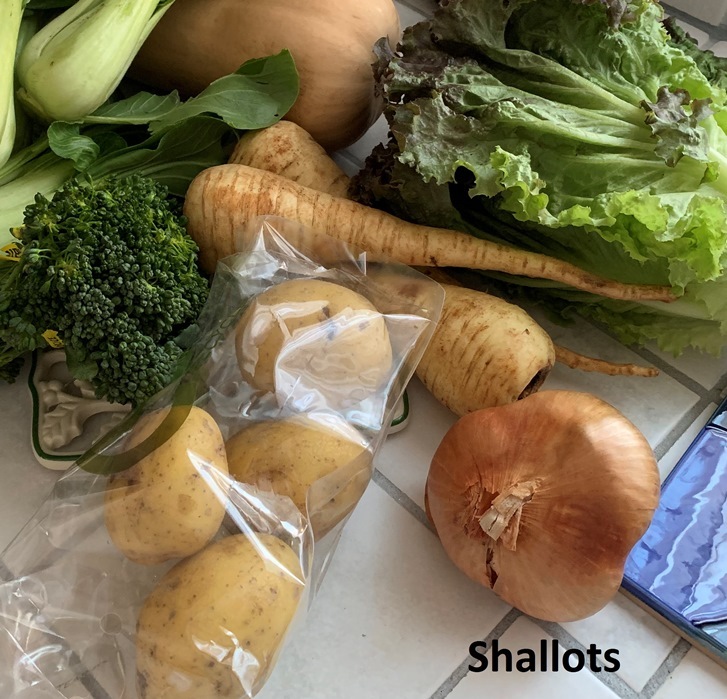 As you may know, if you read my blog, we get an organic box of produce delivered. The service we use allows us to actually pick what comes in the box. It somewhat defeats my whole idea of getting a box delivered, but it is also nice. When I get the e-mail, sometimes I forget to log in and pick what I want in the allotted time so I end up getting what they send. I would not have gotten a sugar pie pumpkin two deliveries in a row, but, my fault, I didn’t stop it. I felt as if we had just had stuffed pumpkin so I didn’t want to do that again so I decided to make pumpkin soup. I looked up my post of Roast Pumpkin Soup and I read what I wrote, so I didn’t want to follow that recipe exactly. And since I was going to just make a few minor tweaks I didn’t think I would be posting about it. Well, my husband and I loved it so much I wanted to make sure I made note of it. I will not be using the other pumpkin soup recipe again. Although, this one is VERY similar, I liked the tweaks I made so this one is much better. It didn’t have any of the bitter that I spoke about with the last recipe. But, as usual, I didn’t plan on posting about it, so I didn’t think to take a picture the night I made it. We had enough to eat on it for three days. So the pictures are of the leftovers. Preheat the oven to 450° F. Wash the pumpkin, then cut so that you can remove all the seeds. Then cut it into pieces. Rub the pumpkin pieces with olive oil and sprinkle both sides of each piece with garlic salt. Then place the pumpkin – skin side up – on a parchment paper lined baking pan. Bake it for 20 minutes. Take the pumpkin out of the oven – here is where you can salt it again if you would like. Turn each piece over and sprinkle with marjoram. Then bake it for about 30 minutes more. This is where you have to decide if it is done or if it needs more time in the oven. Use a fork, poking each piece to see it if is cooked to your liking. I like it to have the roasted flavor so I bake it until there are some browned spots. While the pumpkin is roasting. Chop the shallots. Heat up some olive oil in your stock pot or soup pan. Then cook the shallots. Once the shallots are cooked, add the broth. Stir the broth and shallots. Then add the sherry. Stir the broth and sherry. While stirring add the salt and all of the spices. Bring it to a low boil. When you have the pumpkin puree add it to the liquid in the soup pot. Stir the mixture until the puree and the liquid are incorporated. 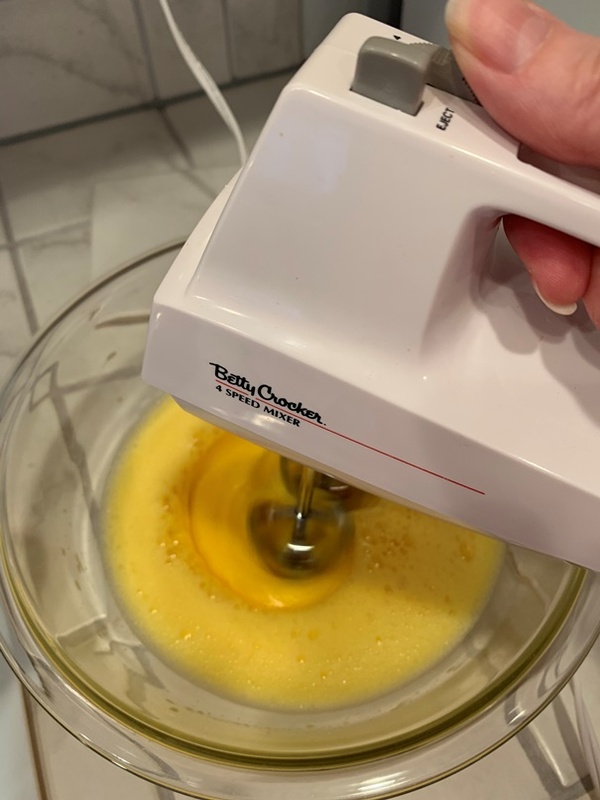 Then add the cream. Stir until the cream is incorporated into the soup. Bring it a low boil. Then serve. 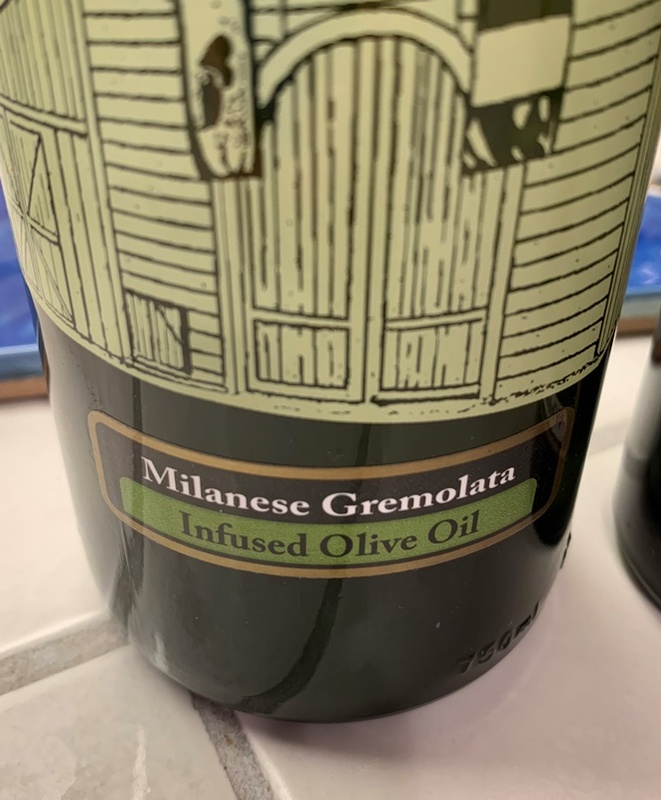 I am including the Milanese Gremolata olive oil as an ingredient because we just bought this magical elixir from Napa and I love it and I am using it in everything. I do think that it really helped elevate the flavor of the soup. But, regular olive oil will work, too. 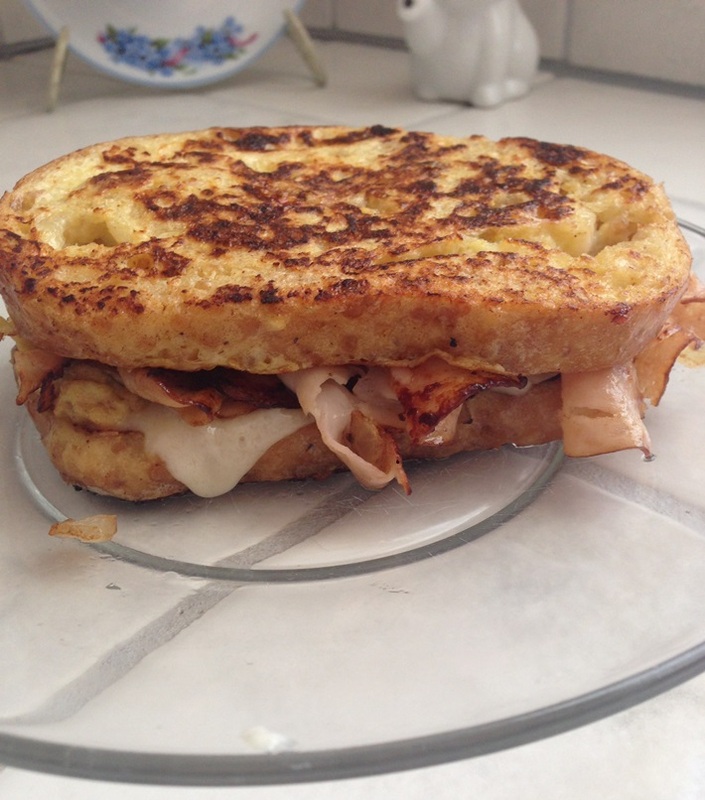 The first two night we had this with some Pugliese bread from the store. It was very good dipped into the soup. The third night I made beer bread adding, a teaspoon of garlic salt, a teaspoon of garlic, and two teaspoons of marjoram. It paired REALLY well with the soup. 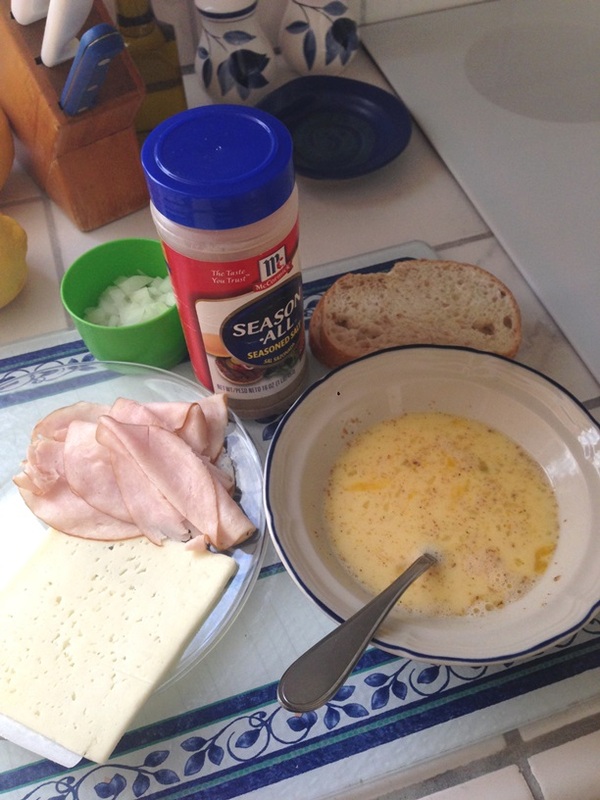 My husband is already pestering me to make this again! I better do it at least one more time before the sugar pie pumpkins are all gone! Well, now I have two pumpkin soup recipes you can make. Which one will you make? I like polenta, but oddly enough, I am talking about the kind that is in a tube. I am not sure I have tried the mush type — oh wait, I think I had a taste of some at a restaurant and it was delicious. But I don’t make that kind. I have only cooked with the tube kind. It is very firm and a bit rubbery. It can be sliced. I imagine it can be made into the mush kind with enough liquid. But, if you’ve read more than one of my posts about food you know I love to roast things. I love to put things in the oven and then be able to do something else while it is cooking. Well, I posted once about Polenta “Fries” so my Cubed Polenta is not that different. 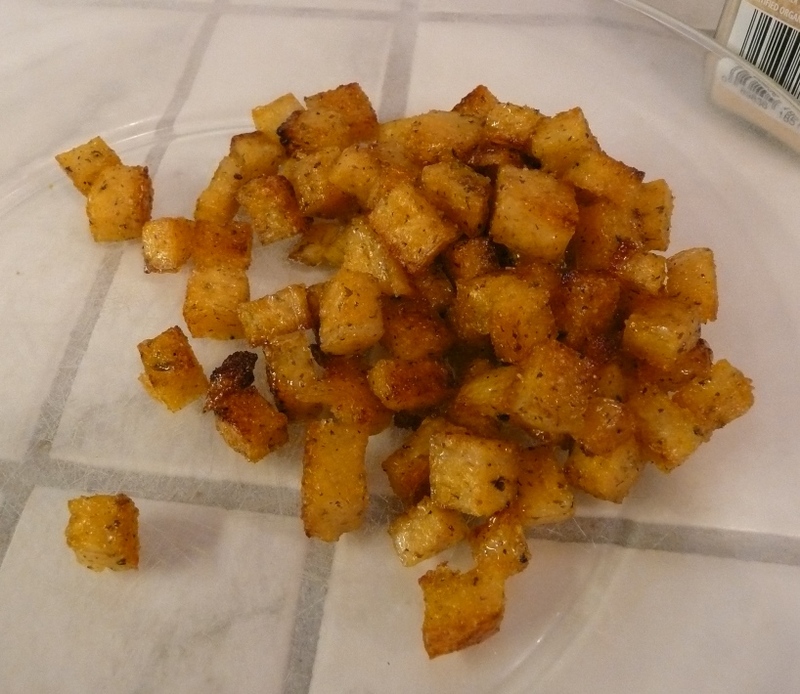 But the “fries” were really french fry-like, whereas the polenta cubes were more like my roasted potatoes. They were very good, as least I thought so. The same cooking method applies the only difference is the way you cut the polenta. Preheat the oven to 450° F. Cut the polenta out of the plastic. 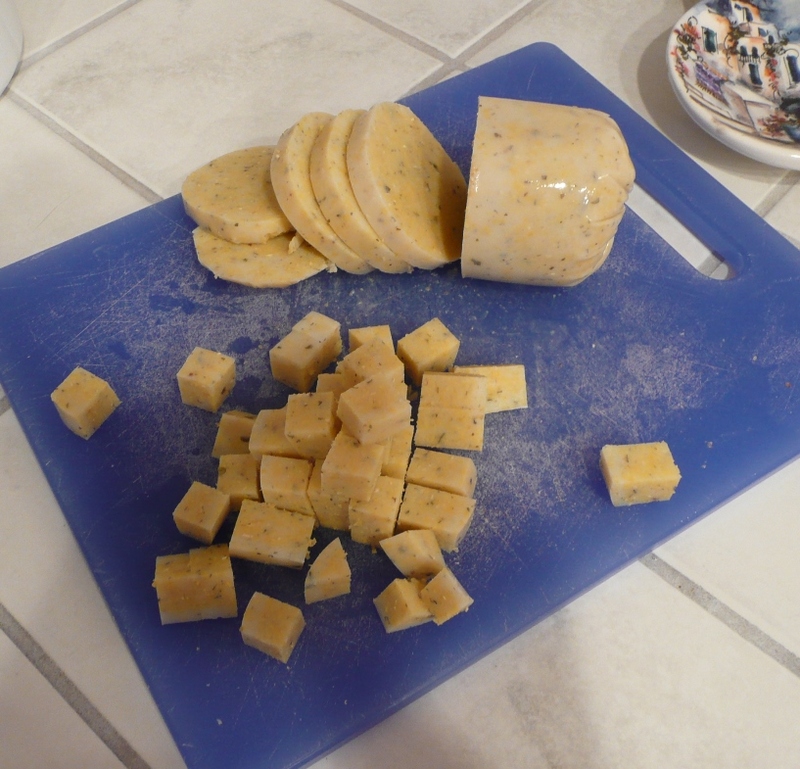 Then cut the polenta into small even cubes. Cut the whole tube into equal sized cubes. Line a baking sheet with parchment paper. Then spread the cubes out on the pan. Sprinkle with a little oil. Sprinkle with the season salt. 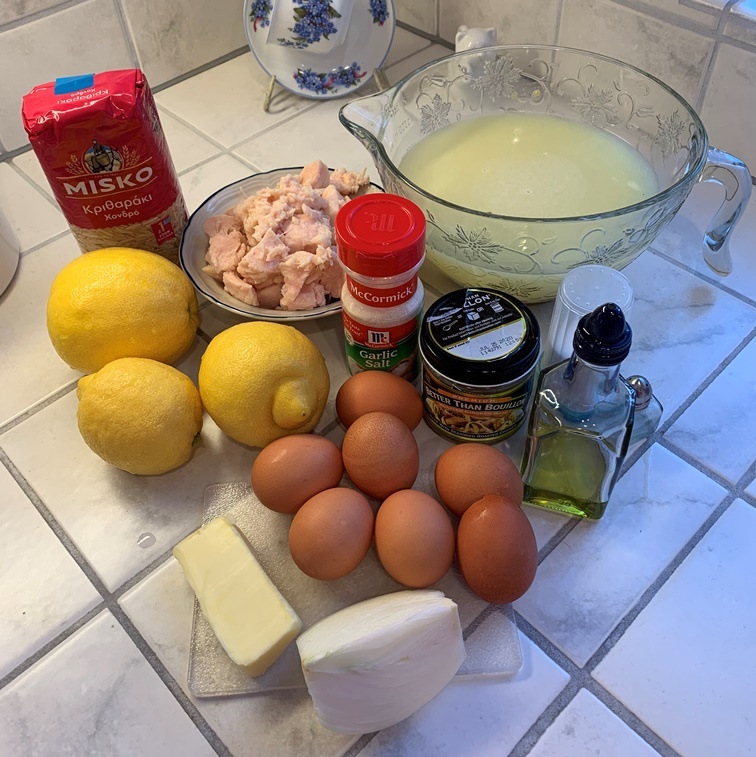 Place pan in the oven. Let the polenta bake for 15 minutes. 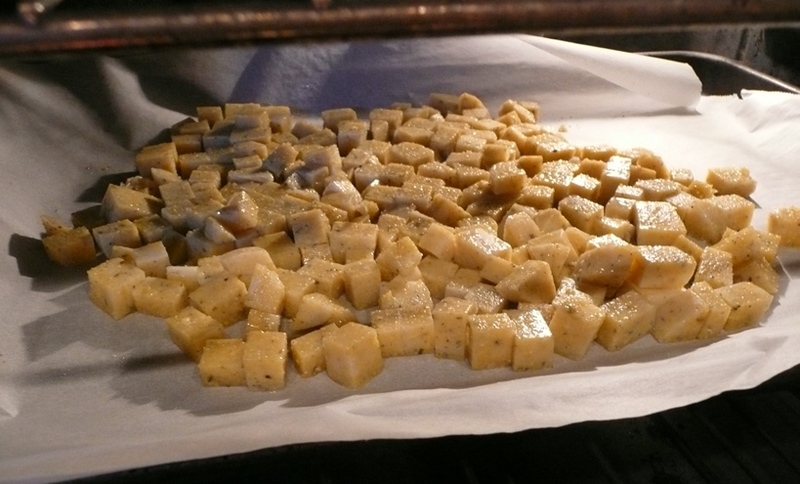 Then take the pan out of the oven and stir the cubes around. Put the pan back in the oven for another 15 minutes. Then check the polenta. If they are done to your liking, take them out and serve. 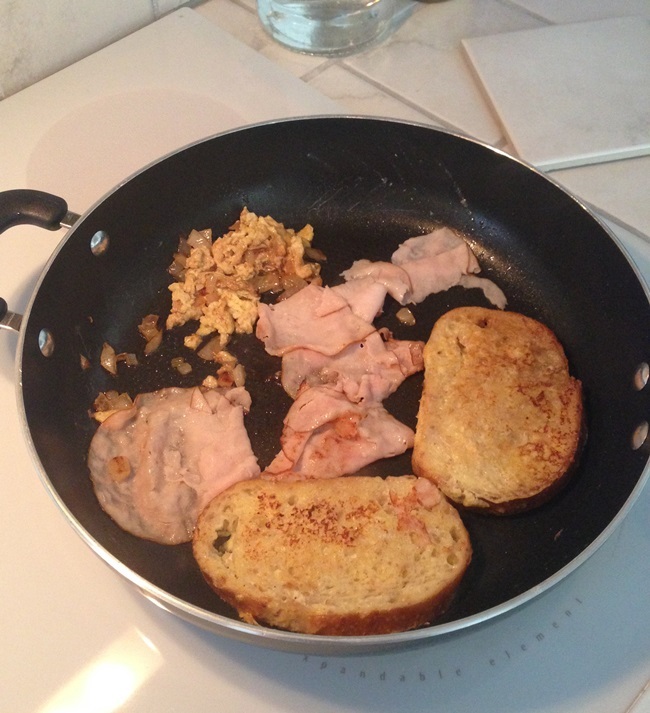 If you want them cooked more, flip ’em or toss them on the pan, then put it in for 10 (or whatever) minutes. If you cut the cubes even then the whole pan should cook pretty much the same. When I do potatoes for some reason I end up with really small ones and big ones and they don’t all cook even so I have some that start to burn before the others are cooked. With the tube it is easier to cut them all the same size. I buy the basil garlic polenta in a tube. I like it to start off with flavor. As I said, the cubes are more like potatoes, in fact my husband kept calling them potatoes. A little bit different texture and consistency but ok. The problem with me typing up my blog before dinner is I end up wanting the food I am writing about. Sometimes I can make it because I have it, but presently I do not have any polenta . . . but I see a trip to the store in my future. In my Polenta Fries post I asked for ideas for tubes of polenta, I didn’t get any . . . so hence, cubed polenta.